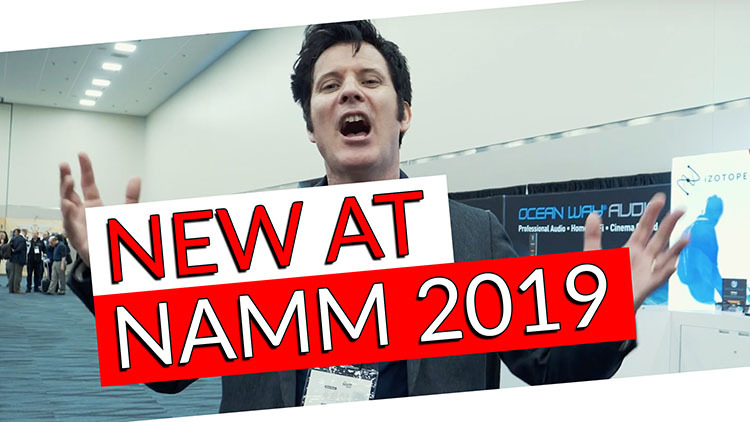 We had a Marvellous time at the 2019 NAMM show this year and put together this blog to show you some of our favorite gear! You can find chapter times in the YouTube video description if something specific catches your eye!! XLR STUDIO CONDENSER MIC FOR RECORDING AND LIVE-STREAMING OPEN, DETAILED SOUND. The ODR-mini delivers creamy, natural overdrive – Everything from pushed clean amp tones to gain filled stacks! It has the same tones as its legendary brother – the ODR-1. You‘ll love the warm mid-gain tones for rock and blues, and the screaming hard rock sounds from the ODR-1 Mini. Plus the mini features true-bypass switching, the SPECTRUM pot with mid-click, fluorescent pointers on the “GitD“ – knobs (Glow-in-the-Dark). Guaranteed to be a BIG part of your sound while a small part of your pedal board. Need to open up a stereo mix, individual drums, piano or guitars and making them wider without sounding phasey and keeping mono-compatibility? Or add depth to dry recordings without changing the tone or timbre? Or turn a mono instrument recording into stereo, much bigger than ever before. It’s possible NOW! Sontronics is proud to introduce their new Nano Microphone! PAUL WOLFF HAS BEEN DESIGNING PROFESSIONAL AUDIO EQUIPMENT SINCE 1975. Paul Wolff began his desire to blow things up at an early age, from changing water into hydrogen and oxygen in a grade school project, to building small explosives to go fishing with. No, he didn’t invent stereo, or reverb; nonetheless, his musician parents always supported him throughout his ventures, he ended up as the house sound man at a DC night club, The Bayou, doing FOH for such “new” acts as Foreigner, Pat Benatar, Dire Straits, etc. This led him into the recording studio end of the industry, and he moved into a DC studio called “No Evil Multimedia”, and during a Synclavier seminar at the studio, he was introduced to a fellow that worked at a company that had just acquired API called Datatronix. Wolff left the studio to start his official beginning in the console business at the new company. Phoenix Audio’s Gyrator EQ is one of today’s most unique and musical EQs, allowing an incredible variety of sounds useful for everything from clean high-headroom mix buss tone shaping to deep frequency carving to smooth Class-A circuit saturation. Available either as a mono 500-series module (running at 24v) or coupled to two of our remarkable Class-A Ascent Mic Preamp/DIs in a stereo 1RU unit, the Gyrator EQ is as powerful as it is fun to use. The Phoenix Audio pure Class-A DI was so popular in our Ascent Series Mic Preamps that we’ve made it available in three stand alone versions: the mono Nimbus stage DI, the 2-channel (1/2RU) Nice D Iand the 8-channel N8 (1RU). Over the past decade or so, the need for more DIs has skyrocketed as instrumentation has incorporated more and more electronic elements. From elaborate analog synth rigs, to multiple laptops, to loop-stations and more, getting excellent tone from multiple DIs is more important today than ever. With their unique gain architecture, Phoenix’s DIs intuitively offer up a wide array of tones, such that working with a direct signal takes on the artistry we tend to associate only with working with mic’d signals. Roswell is announcing a new Delphos II Microphone that has figure 8, a bigger body, upgraded DC power supply, same body, still has the pad on the side and best of all the price is still the same! The Black Hole Series is the result of relentless improvement of technology, spanning more than 30 years and it has repeatedly questioned the status of the all-time classics. Excellent clarity and full richness are how industry professionals describe the sound of the Black Hole series microphones BH2 and BH1S. These handcrafted studio microphones are designed for engineers and producers demanding only the best and give true confidence in any kind of recording situation! Take control of your music with the T4S and T8S ToneMatch mixers, the T4S is an ultra compact 4 channel interface and the T8S is a compact eight channel interface designed for performers. Engineered with a powerful DSP engine and intuitive user control, the T4S and T8S both offer studio quality EQ, dynamics and effects. Sound great with integrated Bose ToneMatch processing and zEQ, especially when connected to a Bose L1 or F1 system for full end to end tonal control. Play confidently on stage with the rugged T4S or T8S using its tactile controls, easy to read LED display and scene recall. The T4S and T8S: true performer’s companions. IK’s iLoud Micro Monitors stunned an industry. Producers and engineers at every level marveled at the performance coming from such a small setup, so IK challenged our team to push its concept even further – to design a new compact speaker to rival 5”, 6” and even 8” monitors. The result is iLoud MTM, and it changes everything about the sound, accuracy and convenience of reference monitors in today’s modern studio. Once you hear iLoud MTM, you’ll find it hard to ever go back to traditional big-box speakers. Sonarworks, developer of Reference studio calibration software, and ADAM Audio, manufacturer of premium monitoring products, announced a partnership that will help creators around the world achieve studio reference sound. The two brands have combined their expertise, and plan to unveil new monitoring solutions first half of 2019. Instantly enhance the functionality of your plug-ins and DAW with twelve different signal modification units. Explore new creative possibilities and quickly add missing features. Each module can easily be inserted, swapped and moved around making new options to correct, convert or tweak your audio. SigMod contains many useful, creative functions which are otherwise difficult to engage. Combine these single-process modules in any order to design the precise routing you require. Auto-resizing keeps the signal flow and functionality clear at all times. Sono is the ultimate audio interface for guitarists and musicians, combining Audient’s award winning analogue recording technology with the world’s best speaker-cab simulation from Two notes. Let us know what you’re most excited about and don’t forget we have a MASSIVE giveaway coming up with many of these companies! !